This Online Slot is an RTG Slot with a Free Games Feature and a Progressive Jackpot. 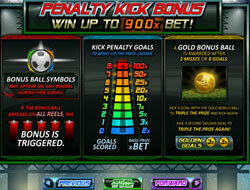 Football Frenzy is a 5 Reel, 50 fixed Payline video slot including 2 Progressive Jackpots and Free Spins Bonus Rounds. Enter the stadium for a full-blown and realistic football match with prizes big enough to compare with FIFA World Golden Cup! Football, Football Players, Striker, Goal Keeper, Referee, Ref's Whistle, Bonus Ball, Stadium, Trophy, Golden Ball, Football Boots, Football Fans, Scarf, Long Drink and high value playing cards. Win up to a 900x Multiplier when kicking the goals in the gate. After 2 misses or 8 goals, the Golden Ball will be awarded that can triple the wins. This can be repeated for another 3x Multiplier!